Jorge Guajardo was one of Mexico’s longest-serving ambassadors to China, serving from June 2007 to April 2013. His time there took him each of the country’s provinces, witnessing first-hand the country’s rapid growth and important transfers of power, as well as visits by two Mexican presidents with two Chinese presidents. Prior to being appointed to his post in China by President Felipe Calderon of the National Action Party, he was consul general in Austin, Texas, a position for which President Vicente Fox, also of the PAN, selected him in 2005. From 1997 to 2000, he was press secretary and communications director for Fernando Canales Clariond, then the PAN governor of Nuevo Leon state. In the years between and since he has held government relations and public-affairs positions in the US, including his current work at McLarty Associates, and remains active in Mexico politics. Christopher Woody: The general sense a lot of people have, across the political spectrum, is that the US is maintaining the status quo or declining in relative power while China is rising in relative power, and I wanted to ask you, having spent a lot of time in both countries, do you think that’s a fair assessment? Is that the trajectory? Jorge Guajardo: I don’t think the United States is declining. I think without a doubt China is rising, but I don’t think China is replacing the United States necessarily. I just think that the United States is losing some of its influence, particularly as it portrays itself abroad through its values. As it stops doing that, it’s losing influence abroad, and … there is no exodus of countries trying to become more like China the way they aspire to be more like the United States, so in that sense I don’t think China is replacing the United States. But certainly it is taking advantage of situations in which the United States would have a certain dominance in the past, and now, as they retreat from the world, China sort of capitalises [on] those opportunities. Woody: You say the US is kind of pulling back from projecting its values the way it has in the past, so are other countries embracing China or are they seeing the US back away and looking to make their own path? Guajardo: I think much of what gave the US sway in the world was its values, what it stood for. It was sort of aspirational, and that in many cases, for instance, that entailed that when a US company was doing business abroad, of course a US company would have certain restraints due to [the Foreign Corrupt Practices Act]. They’re not allowed to engage in corrupt acts, and oftentimes they would be put at a disadvantage against European or Chinese competitors who were more lax in their standards, but the United States could always appeal through their embassies or through their diplomats to that higher calling of the United States, in which [there was] merit-based competition, and more often than not, that would be enough to help the United States overcome that handicap, if you will. I mean, I don’t think it’s a handicap, but that restriction in not being able to engage in corruption. As the United States stops putting an emphasis [on values], and as the United States embraces more of an American First [policy], or calls other countries by names that we’ve heard, I think these countries are less prone to listen to the United States and take the United States as the aspirational country, which doesn’t mean they’re going to go and try to be like China. It just means that when China comes to them, they’re not as reluctant to engage as they would have been the past. Guajardo: I’ll give you an example: telecommunications. 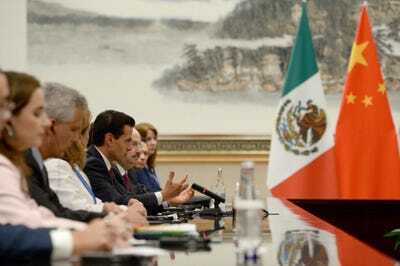 There was, I think for a long time there was sort of a unwritten agreement that countries aligned with the United States, particularly in this hemisphere, woulddefer=”defer”to the United States in terms of how to build their telecommunications infrastructure, so Huawei would come to Mexico and want … to do its infrastructure, and there would be certain pushback on behalf of Mexico, because the agreement was that we could do that in coordination with the United States – not necessarily reserve the sector for a US company, because many of them are European, but it was in essence a US-sanctioned company, if you will … that is no longer there, as the United States sort of starts pulling away and saying it doesn’t care as much about the rest of the world. It gives certain leeway. So that doesn’t mean Mexico’s going to align itself with China. That doesn’t mean we’re going to aspire to be like China. That doesn’t mean our future is with China. It just means that when China comes to Mexico, we just say, “OK, fine … tell us what you’re offering,” and oftentimes their offers are better than the United States, so that’s how China capitalises where the United States is retreating. 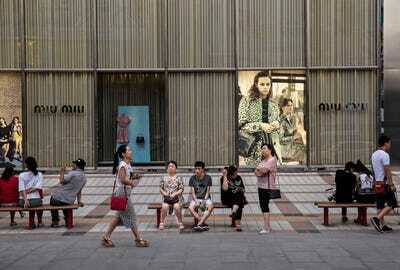 Kevin Frayer/GettyChinese shoppers in front of a luxury store in an upscale shopping district in Beijing, August 28, 2015. Woody: So in your experiences on the ground, interacting with Chinese people, how did you come to understand the way they saw their status in the world? Do they see themselves as this rising country that was in a position to project power or was it another sentiment? Guajardo: So I always say that I was there during an inflection point in China, and to be very blunt, I say I was there at the point where China became arrogant. 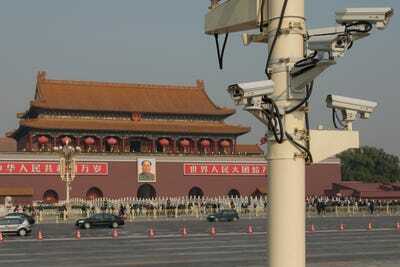 And China can be very arrogant in its dealings with foreign countries. After 2008, with the world financial crisis, and in particular 2009, it started being, “What can Mexico learn from China?” So they started thinking that their model was in and of itself superior, their model of government, of economy, whatever it may be, and with that came a certain arrogance, and I always say that China spends so much time trying to have the world understand it and so little time trying to understand the world. And jokingly, and I insist it was jokingly, but I would always say that China expected to have two ambassadors: A Chinese ambassador in Mexico to explain to the Mexicans how China works, and a Mexican ambassador in China to explain to the Mexicans how China works, and I would say, “So who explains to the Chinese how Mexico works?” And that applies most every other country. 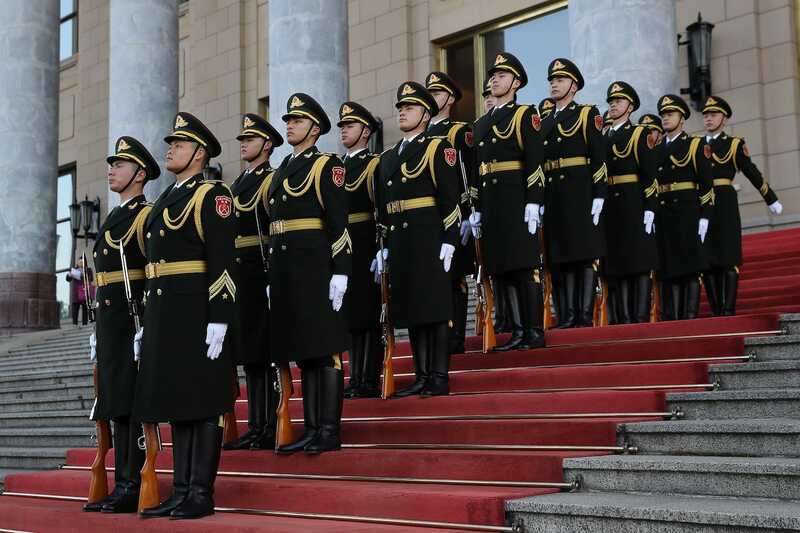 Dan Kitwood/GettyA ceremonial guard awaits British Prime Minister Theresa May and Chinese Premier Li Keqiang at the Great Hall of the People, in Beijing, January 31, 2018. Guajardo: So I would say when you ask how China saw itself, I think historically they have seen themselves as … the Middle Kingdom, as the center of the world, and that hasn’t changed. I mean, in Mexico, China is not that much of a presence. In China, Mexico is not that much of a presence, and save for the United States and probably Europe and Japan, I think most of the world falls in the Mexican category. Woody: Recent events in China, eliminating presidential term limits, that seems to be a fairly significant consolidation of power in Xi Jinping. Is that something that you would have foreseen when you were on the ground there, that they would move in that direction? Guajardo: Well, it just officializes something that was there. So the Chinese president has three titles. 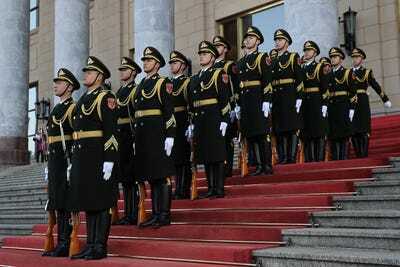 He heads the central command of the military. He is general secretary of the Communist Party, which is the most important title he has, and then the third, the least important, is that he is president, or head of state – that’s the least important title. The other two titles, head of the military’s central command and general secretary of the party, had no time limits to them, and, in fact, when Hu Jintao assumed the Chinese presidency, Jiang Zemin, his predecessor, stayed as head of the central command of the military for a long time afterward. Hu Jintao was the first one to forfeit all power in the transition, when he transitioned to Xi Jinping, so there were all these unwritten rules. I won’t say it was surprising or not. It was just, one could sort of see this may happen; however, in my time there, it was more of a collective leadership during the years of Hu Jintao and the beginning of Xi Jinping. Now it seems to be more leadership of one, so that’s what changes. Wang Zhou — Pool/Getty ImagesMexico’s President Enrique Pena Nieto meets with Chinese President Xi Jinping, not pictured, in Hangzhou, China, September 4, 2016. Woody: In the past Mexico, they wouldn’t defer necessarily to the US, but on decisions like telecommunications, they would consider the US viewpoint. Now it’s not so much the case, so are policymakers in Mexico, are they gauging the relative outlook in the US and China and positioning themselves accordingly? Is there a response to that? Guajardo: So yes, again, that doesn’t mean Mexico as a country will realign itself with China, because there’s not much for Mexico and China, especially because we are strategic competitors. We’re both exporters of manufactured goods, so we compete for markets. There [are not many] areas where we can cooperate, but I think they’re areas in which – again, telecommunications is one example – but oil-exploration contracts are another example in which Mexico would be thinking more along the lines of our strategic partnership with the United States, and even though there were unwritten agreements, those were things that we would just sort of acknowledge that we woulddefer=”defer”to the United States or work cooperatively with the United States in these sectors, and that maybe is not as much the case these days. Guajardo: Let me bring your attention to something that I’m sort of seeing starting to make news, but I don’t think it has gotten much attention … I don’t think China will replace the US anywhere in the world. I don’t think people will start sending their children to school in China. I don’t think people will start buying yuan or property in Shanghai. I don’t think countries aspire to become like China. I think the United States still holds that place in the world. However, when I say that China stands to benefit from the United States retreating, at least rhetorically, I’ll give you the example of the 5G network. And that’s no small thing. China has been very aggressively trying to export its 5G technology, and whereas before many countries would wait for the United States and follow the lead, I think now there is more willingness to listen to the Chinese offer, and whichever country develops a 5G network gets to set the standards going forward. The 5G network is going to be much more important than a 4G network. The 5G network is Internet of Things. It’s driverless cars … So if you’re Tesla and you want to sell in a country where China has developed the 5G network, you’re going to have to comply with Chinese standards, so it is an important advantage that they get in these things. I think when this is happening precisely at the same time that you have a president obsessed with coal and steel, and you have a White House obsessed with limiting as many foreigners to come into the United States and thus limiting technicians or people who would come to act as programmers – it’s just giving China a path to winning this race, and I think they stand well-positioned to do that. That’s where the battle is going to be in the future. It’s not going to be with ports or aircraft or landing strips. It’s … who gets to develop the 5G network in Latin America, in Africa, or maybe in Europe, and many European countries, again because of this Trump way of dealing with them, are going with the Chinese option, and that’s just going to put American companies at a disadvantage for decades to come. And I like to say that when you’re number two at this, you never pick up. It’s like Yahoo may be number two to Google – when was the last time you used Yahoo? If you lose supremacy in these things, you never catch up, and … the United States is setting the ground for China to assume supremacy in this area.